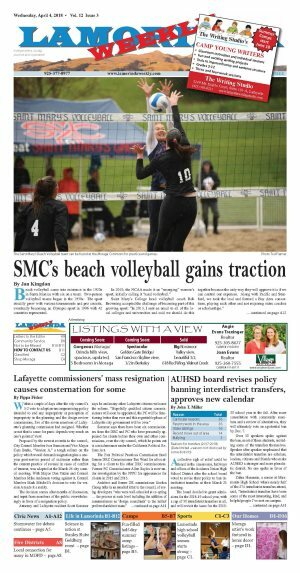 A collective sigh of relief could be heard in the classrooms, hallways and offices of the Acalanes Union High School District after the school board voted to revise their policy to ban interdistrict transfers at their March 21 meeting. The board decided to grant admissions for the 2018-19 school year, with a cap of 50 interdistrict transfers in all, and will revisit the issue for the 2019-20 school year in the fall. After more consultation with community members and a review of alternatives, they will ultimately vote on a potential ban by Dec. 7. Over 30 speakers spoke against the ban, most of them students, including some of the transfers themselves. Speaker after speaker emphasized that the interdistrict transfers are scholars, leaders, citizens and friends who make AUHSD a stronger and more pluralistic district. No one spoke in favor of the ban. Zahra Hasanain, a senior at Miramonte High School where nearly half of the 274 interdistrict transfers attend, said, "Interdistrict transfers have been some of the most interesting, kind, and helpful people I've met on campus. They're leaders of different equity groups and clubs on campus, and often excel academically." Of the 129 transfers at Miramonte, 58 percent are people of color. The limits were proposed due to the district's classification as Basic Aid for the last three years, meaning that the local property tax allocation exceeds the Local Control Funding Formula. Since Basic Aid districts do not receive funding per student, the estimated expenditures for interdistrict transfer students would cost the district an estimated $1.75-$2.25 million next year. Superintendent John Nickerson said, "The board sees the value in interdistrict transfers, but without funding it creates a tremendous financial burden." Students expressed that they were glad the vote was paused, but would continue to mobilize and speak out against what they see is an unjust, regressive step. In other district news, a calendar task force explored alternatives and made recommendations on the upcoming academic calendars for the next two years. For 2018-19, school will begin on Aug. 20, with the first semester ending on Jan. 7, and the last day of school on June 6. For the following year, 2019-20, the school year begins a week earlier on Aug. 13 in order for the first semester to end before Winter Break on Dec. 20. School will dismiss for the summer on May 29. 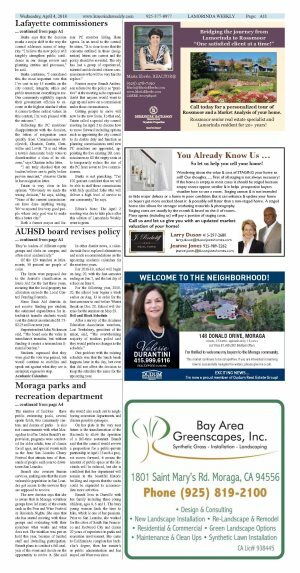 After a survey of the Acalanes Education Association members, Lori Tewksbury, president of the union, said, "The overwhelming majority of teachers polled said they would prefer no changes to the schedule." One problem with the existing schedule was that the lunch break happens later in the day, but even that did not affect the decision to keep the schedule the same for the upcoming year.